LGS is replacing traditional construction methods. What’s driving the change? As the world around us evolves, so must our building systems and processes; and there are many factors driving a change in attitude towards how communities are built. 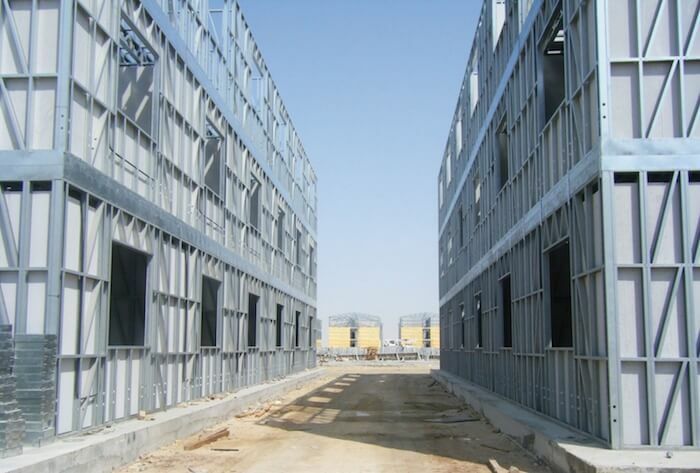 Social, political, economical and environmental forces, as well as technology and the growing scarcity and expense of skilled labour-forces are all factors contributing towards a shift away from traditional methods of construction, and today, we are seeing a growing demand for alternative methods of construction, such as Light Gauge Steel (LGS), and also known as Cold Formed Steel (CFS). LGS is revolutionising the way buildings are created by offering improved quality, speed of construction, design flexibility and environmental performance, these modern methods are financially attractive alternatives to slower, resource-heavy traditional methods of construction, such as timber, concrete and hot-rolled steel. Our new eBook, “The Future of Construction – The case for building with Cold Formed Steel”covers all of these benefits and applications of LGS construction in depth. In this article, we explore 5 key trends that are reshaping the the future of construction. Meeting the global challenges of growing populations and increased construction demands are key issues facing urban planners, developers and builders today. Slow, resource-heavy traditional methods of construction in many countries simply cannot keep up with the pace, requirements and demands associated with rapid urban development. Yet at the same time, governments and regulators – not to mention consumers – are demanding high-quality, safe and attractive buildings. LGS responds to all these challenges. And it’s proving a much needed answer for countries with rapidly expanding urban populations, such as India, which is expected to emerge as the world’s 3rd largest construction market by 2020, adding 11.5 million homes every year – a target otherwise impossible to achieve using traditional building materials. People are demanding ‘better buildings’ – defined as; warmer, safer, quieter, greener and constructed with less material waste. Sustainable building standards around the globe are being developed and applied with a ferocity never seen before. As an illustration of this, in Singapore’s densely built-up urban environment, with limited land space and few natural resources, green buildings are vital to sustainability. So by 2030, the Building and Construction Authority (BCA) of Singapore aims to have 80 per cent of its buildings certified green — that is, energy and water efficient, with a high quality and healthy indoor environment, integrated with green spaces and constructed from eco-friendly materials. Resource hungry and waste ‘unfriendly’ traditional building have no place in this new plan. To meet Singapore’s green initiatives, alternative building materials and methods, such as LGS, are being considered to meet the plan’s lofty environmental benchmarks. As the world’s population grows, available housing, especially in urban areas, is becoming highly competitive and less affordable. Increasing demand coupled with limited supply of quality housing is forcing prices up. And, the demand for housing is resulting in intensification of available space. Clearly a new approach to construction is required. Solving this issue requires a new approach to construction that LGS can provide. As an example, for the same total building footprint you can gain more internal space per square meter using LGS. Natural disasters such as earthquakes and climatic events like floods and cyclones are forcing many governments and communities to rethink their policies on building methods and standards, introducing new regulations that have construction businesses, civil engineers and developers looking for alternative methods of construction and materials. Stabilisation of governments in developing countries has led to improved economies, and in turn a growing middle classes. And this new middle class is now demanding better services and infrastructure from governments including healthcare, education – and better buildings. Political influences on construction methods are not limited to developing countries. In the United States, non-traditional construction methods are proving popular with developers and builders looking to sidestep the union stronghold on on-site labour. If you want to find out more about the advantages of LGS as a building material and in particular, how the FRAMECAD System will drive ROI and value for your business, download our free eBook today. Whether you’re already considering LGS solutions for a specific project or are considering establishing a LGS manufacturing or construction business, talk to a FRAMECAD expert today.